The South African athlete gets his Paralympic campaign underway, while Jason Smyth is in action again tonight. 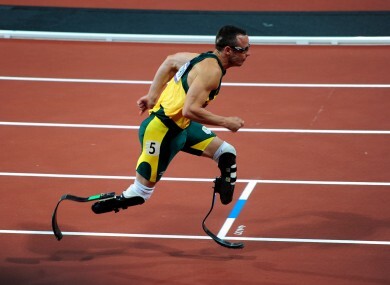 Pistorius is fresh from an impressive display at the Olympics. EVERY MORNING, WE bring you all of the info you need to make sure you don’t miss a second of Paralympic gold. There is one of athlete who is on many people’s lips today: Oscar Pistorius. The South African, who reached the 400m semi-finals and the 4x400m relay final at the Olympics, participates in the T44 200m at 7.44pm. In addition, as far as Irish interest is concerned, Jason Smyth will continue his bid for Paralympics dominance at 7.15pm. Eilish Byrne kicks things off with the Equestrian Championship Test - Grade II at 9am. Following their disappointment on Thursday, James Brown & Damien Shaw compete in the 1km individual time trial B at 9.30am. Meanwhile, Darragh McDonald is in the 400m freestyle S6 heats at 9.49am. The Women’s Club Throw F31/32/51 Final takes place from 10am onwards, and there’s Irish interest in the form of Catherine O’Neill. And of course, following his tremendous performance in the heats last night, Jason Smyth participates in the 100m T13 Final at 7.15pm this evening. Michael McKillop, who (like Smyth) won gold in Beijing, competes in the Men’s 800m – T37 Final at 8.58pm. The Irish rowing team takes part in the Mixed Coxed Four – LTAMix4+event at 11.30am. Ailish Dunne competes in the discus throw F11/F12 final at 11.45am. At approximately 10.47am, James Scully is involved in the 200m freestyle S5 heats. In sailing, Ireland have two teams competing in the Mixed Sailing Final 1 and 2 at 2pm and 3.30pm respectively. The individual pursuit C5 qualifiers take place between 11.35am and 12.35pm, with Cathal Miller one of those competing. The Mixed R3 10m Air Rifle Prone SH1 qualifiers take place from 1.15pm onwards, and feature Sean Baldwin. Finally, Ray O’Dwyer is in the javelin F33/34 final at 7.03pm. You may have heard of a certain athlete by the name of Oscar Pistorius? He competes in the T44 200m campaign at 7.44pm. And there’s the small matter of Jason Smyth being in action in the T13 100m Final at 7.15pm to look forward to as well. And not forgetting another Irish medal hope – Michael McKillop – whose race begins at 8.58pm. Beijing double gold medallist Ellie Simmonds of Great Britain takes part in the 400m freestyle (heats 10:06; finals 17:54), as she vies for glory alongside fellow teenager Victoria Arlen of the US in what should be a fascinating battle involving two highly prodigious athletes. Paralympics legend Sarah Storey features in the 500m time trial in the Velodrome at 2.25pm, as she bids to add to the substantial list of accolades she has already acquired over the course of her career. Email “Paralympic breakfast: Get ready for Oscar Pistorius”. Feedback on “Paralympic breakfast: Get ready for Oscar Pistorius”.